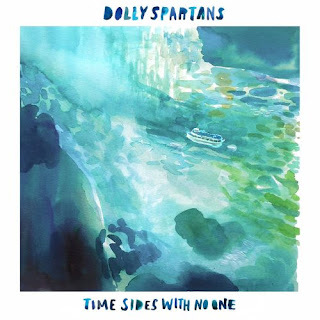 A couple of weeks ago the opening verse of Hanging Out ear-wormed into my mind and resulted in this EP from New York 4 piece, Dolly Spartans, becoming something of a permanent recent fixture on my daily playlists. This brilliant track (see below) is perhaps indicative of the general aesthetic. Essentially it is indie rock that appears to be influenced by the mid-2000's Postcard Records led by Franz Ferdinand, Kaiser Chiefs and Bloc Party and the spiky, angular guitar works of 1980s bands such the Fire Engines and Josef K.
However, to dismiss them as merely the third wave of Postcard revivalism would be a complete disservice to the way in which many of their tracks develop throughout various melodic intensities and schematics. Whereas Postcard was glorious agitated quirk, Dolly Spartans tracks tend to move through various musical nuances and tempo's whilst never venturing to far from a Postcard core. Notably a track such as the opening, When the Wheels Stopped Moving, starts out with a repetitive jangled riff, before moving into impassioned guitar-pop and finally the sort of spiky guitar work referred to above. With 4/5 tracks being well over four minutes, such a developmental ethos breathes throughout the EP. Most notably, the true stand out of the release, It's Not Easy (see brilliant live version above) provides beautifully jangled sparse arrangements and The Bends-era Radiohead vocal sparsity that gives way to a controlled aggression that fights for the listener's attention amid frequent glimpses of perverse melody. 12-13 years ago this band would have been contenders for whatever commercial crown they deemed necessary, for that was 'their' time. In 2018 they will just have to be satisfied with being considered brilliant.